Liu is a widower living in an area of China that is slowly flooding as a result of the Three Gorges Dam being constructed on the Yangtze River. He has taken advantage of the flooding by becoming a scavenger. As people abandon their homes that are about to flood, he goes in to find anything of value that they may have left behind. One day, he finds a baby girl. He takes her to his broker, Fang Shuping, who says he’ll help Liu sell the baby. But when their trip is interrupted, Liu has a change of heart and decides to keep her. He names her Rose. As Liu learns to care for Rose, he also continues to mourn the loss of his wife and the baby she was carrying when she died. Eventually, he finds love again with Mei Ling, a waitress who works at his friend’s noodle shop, and they try to build a family life together ~ but it’s a struggle in many ways. At the same time, Fang Shuping is on his own journey, becoming reunited with a former lover, and helping her and her family fight against the forced resettlement the government has imposed in the wake of the impending flood. With In the Lap of the Gods, Li Miao Lovett has weaved an exceptional story of the clash between history and progress that is happening today in modern-day China. Millions of people have been subject to forced resettlement in China, as those in Lovett’s story are. They are removed from fertile land that their families have farmed for generations, and sent to less desirable land with little money to rebuild to the same standard of life. Liu, Fang and the other characters in the novel are fighting for their lives, trying to hold onto their history, as the government and nature take over. I highly recommend In the Lap of the Gods. I think it would especially make an excellent book club selection. There are so many themes to discuss. It’s beautifully written, despite the subject matter. And it opened my eyes to the reality of life for many in modern-day China. 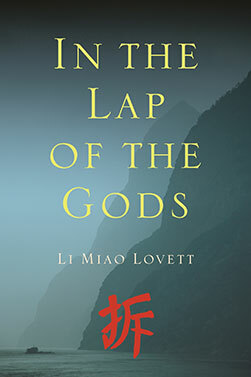 For more information about In the Lap of the Gods, visit Li Miao Lovett’s website. This review was written based on an ebook copy of In the Lap of the Gods that I purchased from Barnes and Noble.